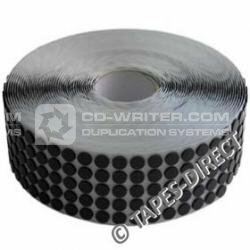 Bulk Roll of 1000 Foam CD Studs for mounting and removal of CD's and DVD's to presentations and greeting cards. The 16mm diam x 3mm studs have a permanent adhesive coating and are suitable for displaying single discs. Low profile (approximately 3mm high), the studs will not stop cards or presentations closing. Ideal for making a real impact when showing off your latest home DVD or making a corporate presentation that includes data CD's or DVD's. SUPERSTUDS . - . CD . FOAM . STUDS . Black . per . 1k . roll . Fantastak .